Making wild yeast is a more healthy way to make wholesome bread at home. Once you figure out how this is made, you can bake the best artisan breads at home. Traditional breads made with Wild yeast has a very distinctive flavour and taste. Once you start eating a bread made with Wild yeast, you will never go back to instant yeast breads. Have fun, its not the easiest thing to do. But the rewards are priceless. 2. 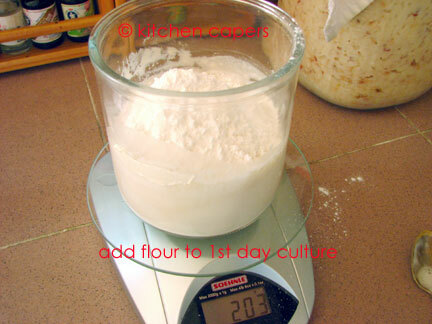 Then measure flour and stir till its well mixed. 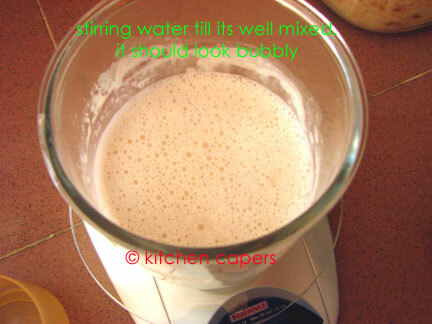 3. the mixture should look very sticky as shown. 4. Cover it and leave it aside in a dry and warm place, untouched for 2 days. 5. By the next day, it should double in volume. Open the cover to see if its "ALIVE". There should be lots of bubbles popping up to the surface. The mixture should smell sour and mouldy. Cover again. 6. Leave it alone for another day. 7. By the 2nd day, it should double from that. 1. 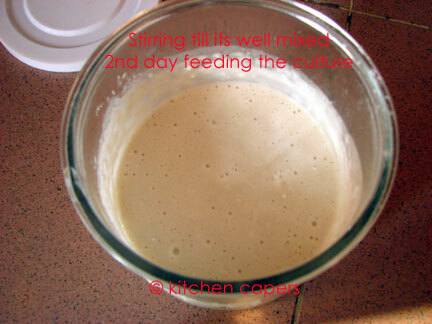 Add 100g of water to the 1st day culture, stir till its well mixed, no lumps. The mixture should look like this..full of bubbles. 2. Now add 100g of flour and stir again till there are no lumps. 3. This is how it should look like after flour is added. 4. Leave this covered slightly. Don't press down too much, leave a small gap. 5. Repeat the process of feeding the culture for at least 7 days. On the 8th day, the wild yeast is ready for use. to use it, use a CLEAN SPOON to scoop out what you need. 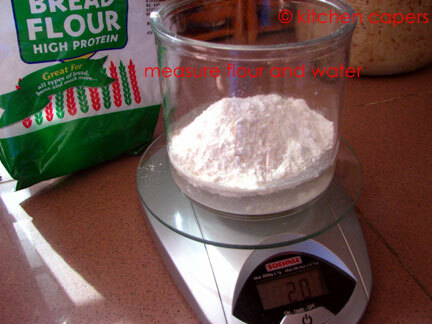 Example, most bread recipes needs 7g to 10g of instant yeast. So with this, you take 1 tbsp of wild yeast. If you make bread every day with the wild yeast, you have to 'feed' the yeast again. Add 1 cup of water, 1 cup of flour. Basically just follow the same steps above. Basically you can use plain flour, bread flour or even Rye flour. Water must be distilled water, if not use bottled mineral distilled water. I have tried using very sour Pineapple juice(extracted from making pineapple jam/tarts)..works wonders. yeast has a sweet pineapple flavour. And its natural. Keep it in a airtight jar and store into the fridge. To use, remove from the fridge at least 4 hours before use to 'wake' up the yeast. Gina - I heard people talking about this before and they said they use this culture to make sour dough. I did not believe such thing can be true. Well, seeing is believing! Thanks Gina. I wanted to do this again as one of the KC members shared his Italian Bread recipe here. Ages ago..and in my haste to try his recipe, I forgot to add yeast! the joke back then was he said i must have been culturing wild yeast in my kitchen. I did that italian Bread without any yeast and it came out fluffy, soft and very good. This is very true..Ruyi. Because our Asian Chinese roots uses this 'formula' to make the traditional mian zhong or pau zhong, without yeast. And I have done that too. Successfully..! Hi Gina, if we were to use this natural yeast, what is the percentage/ratio to add to flour? How do we 'feed' it? Do we make another batch to add on to it? Or just add flour and water to fermented mixture? Will it go bad? I mean, if we see green/black mould, can it still be used? I will update this topic tomorrow. Coz i want to show the pictures of how to feed it, etc, etc. it won't go bad as long as you use a clean spoon to scoop out what you need each time. to feed it would mean you add 100g of flour and 100g of water again. You only need to feed it when you remove something out. not feed it when its not been used. wait ..tomorrow i show more pictures. When you visit me on Saturday, i can give u a portion of this wild yeast to play. then I think you need to bring 2 glass jars now and a bigger bag! you can cover it with a cloth, then with a cover.like I did with wine.the best culture pot is an earthern ware. my next trip to China, I am going to invest on a few pots just to make wine, yeast. Wombat, if your sourdough culture stinks, it has gone bad. It shouldn't take 10 days to make. Throw it away and start again. Matured sourdough should smell slightly sour, slightly nutty and has a bit of alcohol smell. It shouldn't give out a bad ponk. I have been baking with sourdough now for more than 2 years and I can say it produces amazing tasting bread. I bake mostly artisan breads. Gina, you still need to feed the culture regularly if you do not use it, otherwise it will starve and die. I keep mine in the fridge and feed it 15:30:30 (starter in grams:water in grams:flour in grams) every 2 weeks if not making bread. my chef did in sch too.. ahha it's still smelly.. may be coz we not used to it..
thanks Chips..the last time I did this was more than 3 years ago. Last time never make notes. Now rusty and forgetful . I remember something I had to do in between. so i had to do this again to see what happens. It does not stink. It is no worse than the smell of making rice wine because that is basically what happens. 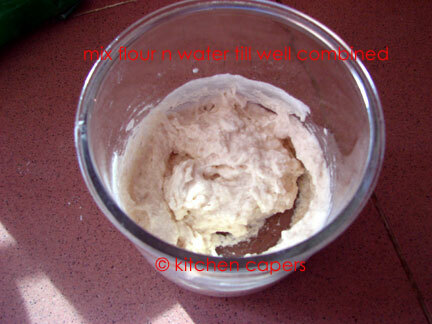 The wild yeast/lactobacilli feed on the flour and produces CO2, alcohol and lactic acid. Hence you see the bubbles, it smells sourish and a bit like beer. I think the infor that you can leave the culture at room temperature comes from bakeries. They use the culture every day, hence they feed it everyday, take out what they need to bake and then feed it again and it goes on. When you make bread you feed it and keep some for storage culture. 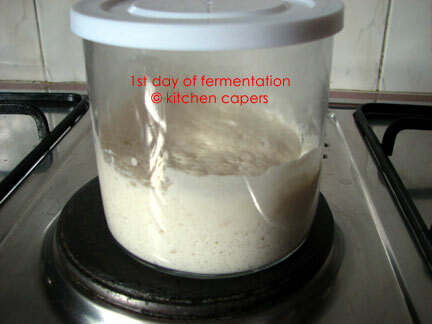 If you don't make bread for a while then, you refresh your culture by removing some of it and feeding it for storage. The rest you can either discard or if you are like me who does not like to waste food, use it to make sourdough pancakes. yes..it shouldn't stink like what you could imagine. It smells funny when you put it near your nose. We are so accustomed to nice cooked food fragrance that we are very put off with yeasty smell. Or maybe I am so used to wine fermentation smells that I now thrive on it. Chips, yah, my basic bread knowledge came from Commercial bakers. And some food critics who are Buay's friends. In fact, my rice wine knowledge also comes from commercial wine producers in Singapore. I had a jar of wild yeast in my fridge years ago. My maid was taught to open every pot/jar and sniff..if its smell bad, junk. And i forgot to tell her not to junk the yeast. So now my fridge only has WINE, chilli pastes of all sorts and pickles made with home made wine. wait till you see my freezer..got a 10 year old Master sauce in there. Goodness, I feel like a mountain tortoise to think that they stink. You are very lucky to learn tips from commercial bakers. We have to learn from each other and trial and error. I am watching your sourdough journey with interest and happy this ancient method of making bread is making a revival. Last Feb, I taught my Mom to bake with sourdough. She remembers this was how bread or rather pau was made when she was growing up in China. Isn't it interesting that ancient civilizations in different parts of the world know how to make bread with natural yeast? The methods may differ slightly but the principle behind it remains the same. I only learn later from them after so many trial and errors. In my work with volunteers and social enterprise(halfway houses), I met many such bakers. Its through our collective volunteer work together, we learnt from each other. With wine, I got lucky due to my work with Food and Travel magazine and met the boss of Ang Leong Huat who manufacturers all the local brands of Hua Tiao jiu, Shaoxing Jiu, Hong zhao jiu, etc, etc. The boss' sister shared with me many tips on wine making at home. My wine making at home is now the best home made wine because of her generous sharing. So i want to use this knowledge to apply on the yeast. I just took more photos..going to load up later. Again? Oh no! You should ask her to do it the next round. Oh dear, Gina. So sorry to hear that. Pity I did not see this earlier. 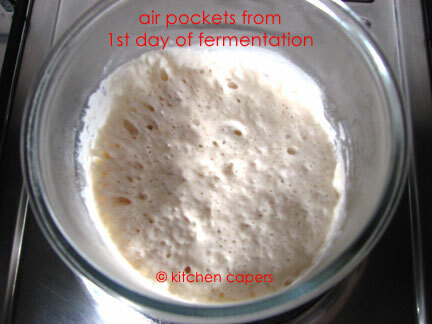 You could still have saved your starter by using whatever is left sticking to your jar, add equal weights of flour and water, say 50g each, swish it around, cover and leave it to ferment again. Once you have an established yeast colony those little beasties are hard to kill except with heat. thanks for the advice. But when she spill it, she thought it smells bad and she quickly threw it out for me. And then tried to tell me ..I was in the toilet..I can't really hear what she said.so I said "ok!" never mind, I will start a new batch tonight...! That's the spirit, Gina. Better luck this time.